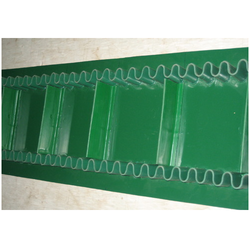 This belt is Oil & Grease resistant & Food Grade quality belt.We are specialist for manufacturing Ultrasonically Welded Cleated Conveyor Belt, this belt have a special features that this belt cleats & sidewall have a great strengh due to Ultrasonically welding. 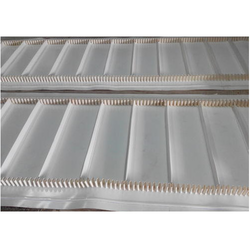 We are specialist for Manufacturing Sidewall Cleated Conveyor Belt, this belt have a special features that this belt cleats & sidewall have a great strengh due to Ultrasonically welding. "Cleats" & "Sidewall" are fixed on belt with ultrasonically welding, hence durablity has been stronge as compare to normal cleat & sidewall stick on belt through sticking solution , normal sidewall & cleat sticking throgh solution, this procedure is so time saving and cost wise also so cheap but quality wise not durable & strong. We mostly suggest to our customer our Latest procedure i.e. Ultrasonically Welding of Cleat & Sidewall on belt. Actually, this type of belt has taken more tome for manufacturing, mostly our delivery period of this belt is 8-10 days. We also specialist in Oil & Grease resistant belt & Food grade belt with cleat & sideall. Due to ultrasonically welding Great strength & Long Life of the belt. Looking for Sidewall Cleated Conveyor Belt with Ultrasonically Welded ?